BRUSSELS (Dow Jones)–The European Union’s 736 members of parliament Tuesday elected former Polish prime minister Jerzy Buzek to be the new president of the European Parliament. 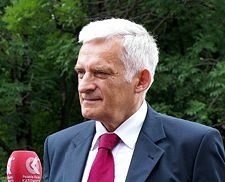 Buzek, a member of the conservative European People’s Party received a resounding endorsement with 555 votes, compared with 89 vote for Eva-Britt Svensson from Sweden from the communist left. Buzek will serve a two-and-a-half year term – half of the new parliament’s five-year mandate – before handing over to socialist bloc leader, Germany’s Martin Schulz under a deal sealed between the parliament’s two biggest factions. The European Parliament is the only elected institution of the European Union, serving alongside the executive European Commission and the European Council of national governments, and it has joint decision-making with the European Council on key legislative proposals made by the European Commission. The new Treaty of Lisbon, if voted through in a second Irish vote on Oct. 2, will increase parliament’s powers by extending co-decision to virtually all areas of E.U. policy. The EU is trying for stability, growth, a stronger military, and the appearance of broad representation. Having a Polish leader who agrees appears helpful for that goal. Of course, those in the EU generally do not know where all of this is heading. But those who understand Bible prophecy can. This entry was posted on Tuesday, July 14th, 2009 at 5:08 am	and is filed under Prophecy.